BIG LOVE FOR BIG DOGS: We love our big dogs! We all know that dogs come in many different shapes and sizes. From tiny Pomeranians with big personalities through to sweet, gentle and affectionate great Danes, no two dogs are the same. Earlier this year we featured some of the bigger breeds we had available for adoption at our North Melbourne shelter. With a new group of big softies in our care, we thought it was time to again show some big love, for big dogs. All these dogs, except for Rayna have been through our behaviourial program so please call in for more information and to book a pre-adoption appointment with our staff. Greyhound cross Noodle is a well behaved young man that, true to his Greyhound nature, loves nothing more than spending his days lounging around inside. A laid back dog, this young man gets along with other dogs; however his perfect canine match is another large, chilled out character much like himself. Noodle’s ideal match would be someone who is willing to give this big, affectionate softie the support he needs to build up his confidence in his new home. An enthusiastic young man, one year-old hound cross Cheeko is an intelligent dog whose has been looking for his new home for nearly a month. Due to his enthusiastic nature, Cheeko can sometimes be overexcited and boisterous which can result in him knocking things over unintentionally. He doesn’t get on with small pets either. Cheeko’s ideal match is someone who can give this playful dog lots of exercise and mental stimulation to ensure this clever boy is entertained. His new best friend should also be committed to Cheeko’s ongoing training to ensure this beautiful boy maintains his good manners and character. Labrador cross Riley is a happy and affectionate boy who has fantastic social skills. Loving the opportunity to meet many other dogs, Riley would suit a home where he can spend his days with another well-mannered dog. Sadly, Riley has previously shown signs of anxiety, but during his time with the Home, the behaviour team have been working with Riley to manage this. Riley does need an owner who is committed to putting this kind and affectionate boy through positive-reinforcement based group training classes and working with him to maintain his calm behaviour when he is left alone. Shy pointer cross Liz is a beautiful, gentle dog with a sweet and loving nature. While it takes a bit of time for this gorgeous four year-old to feel comfortable around new people, with a little bit of gentle encouragement she quickly gains her confidence. As a pointer, Liz does require a lot of exercise and would suit an owner who is equally as active as she is. Liz would also need an owner who is committed to putting this sweet, loving lady through ongoing training to build her confidence and social skills. A beautiful black Labrador with a happy, relaxed demeanour, six year-old Rayna is an ideal match for an owner who is willing for this affectionate lady to be involved in their life. Like a lot of Labradors, Rayna is an intelligent, outgoing and active dog who needs daily exercise and mental stimulation to ensure she remains happy and healthy. While she has undergone some training in the past, Rayna will need some ongoing obedience training to ensure she settles into her new home. 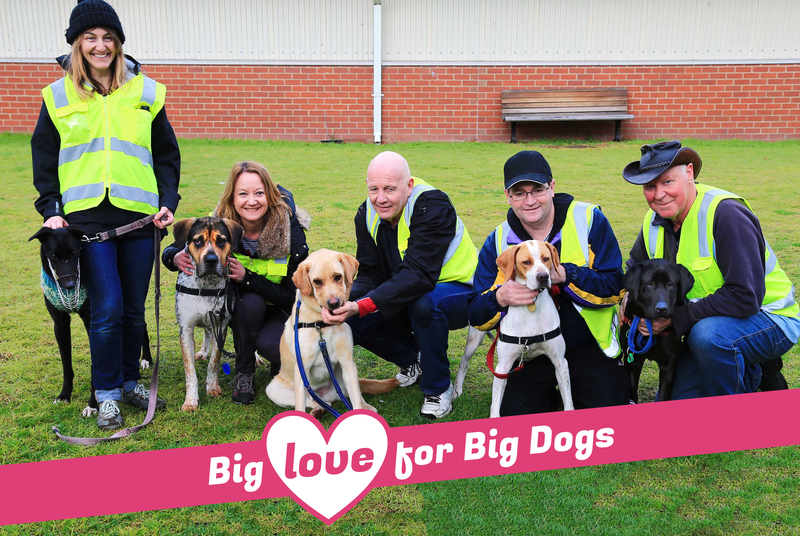 If you think that you can show some love for these big dogs, come down to our North Melbourne shelter at 2 Gracie Street, North Melbourne and meet them in the fur. All these dogs, except for Rayna have been through our behaviourial program so please call our North Melbourne shelter on (03) 9329 2755 for more information and to book a pre-adoption appointment with our staff.